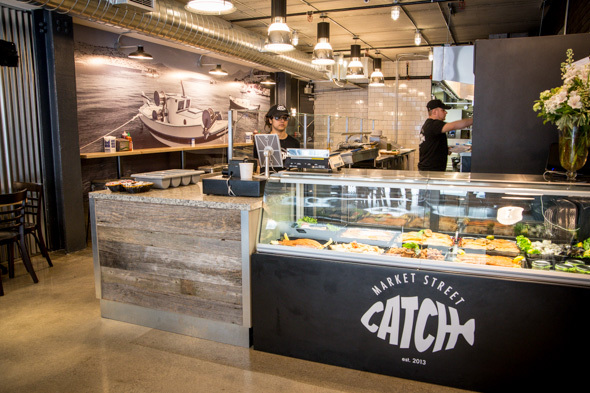 Market Street Catch is the latest seafood-centric offshoot from Buster's Sea Cove owner Tom Antonarakis. 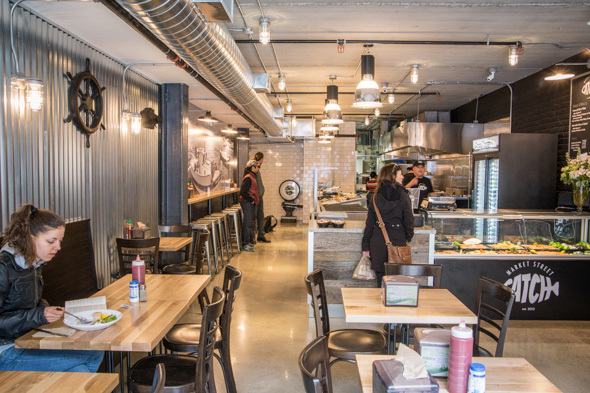 The new spot has docked on the newly redeveloped restaurant row that runs along the west side of St. Lawrence Market between Front and The Esplanade. Inside, the 26-seat space by Squarefoot Design is decked out with corrugated metal, a calm sea-themed mural and nautical ephemera. Front windows are open completely to what will soon to be a 14-seat patio - on a breezy day, I swear I can even smell the lake. 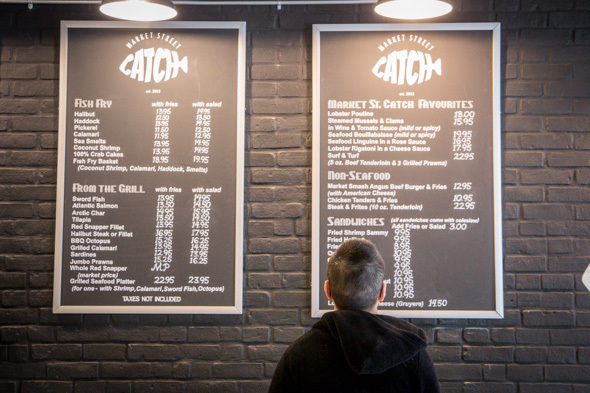 Upfront, the fresh catch is displayed on ice; orders are taken at the counter and then called out for pick-up at the open kitchen. Service style is informal, but that doesn't mean you'll be eating fish wrapped in news paper or chowder from a cup. Creamy seafood chowder ($7.95) is served in big steaming bowls full of chunks of potato, shrimps, scallops and tilapia, and given a deliciously smoky flavour from smoked salmon and bacon. 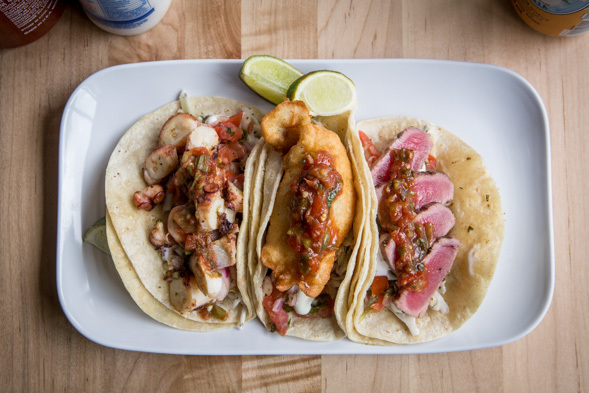 Tacos ($15) are served three per order and can be had in a choice of fillings like halibut, shrimp, octopus or seared tuna. If only they were available a la carte - I could have been swayed to try one of each. Doubled-up tortillas prove necessary thanks to heaping applications of pico de gallo, salsa roja, crema and slaw. 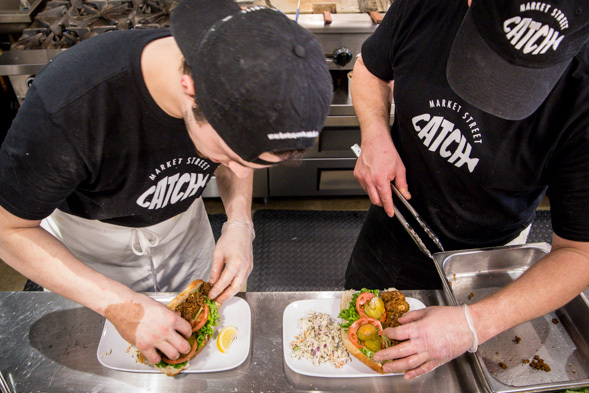 Fish and chip options cover the usual battered and fried selections: halibut ($13.95), haddock ($12.50), pickerel ($13.95), calamari ($11.50), crab cakes ($13.95), or even sea smelts ($11.95). 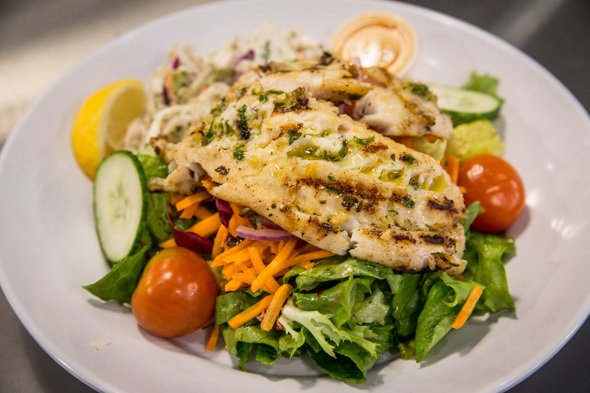 Substitute a salad for a dollar more or skip the fried food altogether in favour of almost a dozen healthy grilled choices like tilapia with salad ($14.50). Fry baskets and grill platters ($18.95-$23.95) offer a varied sampling for the adventurous. 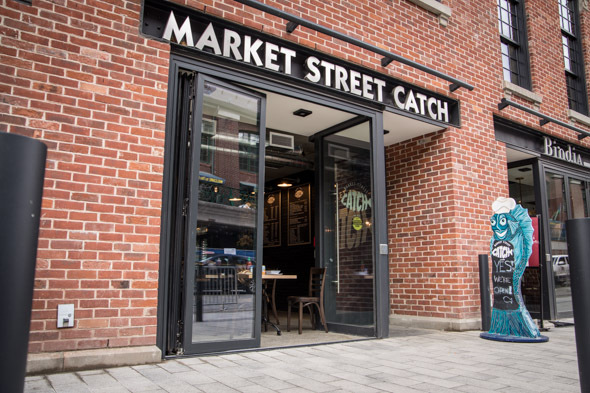 Market Street Catch is currently open Tuesday to Sunday from 11am to 9pm. Summer hours might be extended later.